For the second time, Michelle Bachelet was sworn in as president of Chile, Mar. 11. Bachelet’s first term as president of Chile ran from 2006 to 2010. After her term ended, she was chosen to head “UN Women,” a newly created United Nations entity that promotes gender equality. The Chilean Constitution prevented Bachelet from running for two consecutive terms. 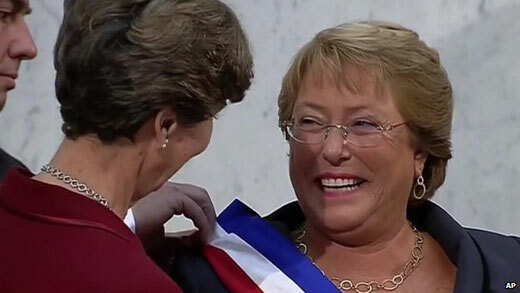 Bachelet accepted the presidential sash from Senate President Isabel Allende, the daughter of Chile’s late Socialist president, Salvador Allende. 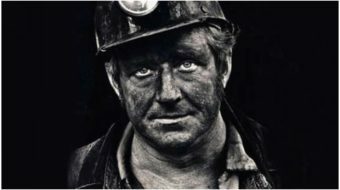 Both women have had remarkable lives given the hardships both have had to endure. Bachelet’s father Air Force General Alberto Bachelet was loyal to democracy and to the democratically elected Allende presidency, but because of this on September 11, 1973, the day of the Pinochet/Nixon-Kissinger coup, he was jailed. General Bachelet died March 12, 1974, in one of Pinochet’s prisons; he died of a heart attack after being tortured. Michelle Bachelet and her mother were also imprisoned for a short time but fortunately they were able to flee the country spending about a year in Cuba and 15 years in Mexico. Bachelet has made one of her primary goals to be improving Chile’s education system. She has said she will increase taxes on corporations and the very wealthy. 2014 brought two firsts since the end of the Pinochet dictatorship: Michelle Bachelet as a two-term president and the other is Allende being the first woman Senate president. Even more important to many is the symbolism: the daughters of democratic Chile elected as the country’s top leaders. “Symbolically it’s very potent,” said Camila Vallejo, the former student leader who rose to international prominence during the 2011 rebellion against then-President Sebastian Pinera‘s education policies. Vallejo was elected to parliament last year on the Communist Party ticket, advocating for human rights and gender equality as top priorities for the new government, the BBC reported. Bachelet’s election continues the trend of left and left-center governments throughout South and Central America, including Nicolas Maduro of Venezuela, Jose Mujica of Uruguay, Ollanta Humala of Peru, Rafael Correa of Ecuador, Dilma Rousseff of Brazil, Evo Morales of Bolivia, Daniel Ortega of Nicaragua, and most recently, Salvador Sanchez of El Salvador.